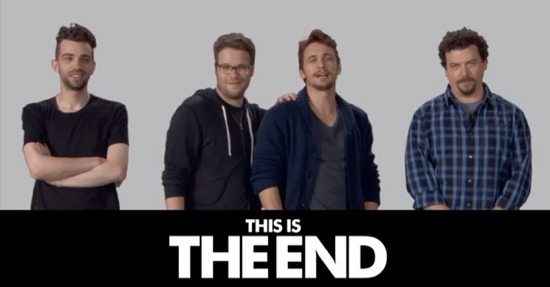 Imagine a world where the characters from Pineapple Express and Lord of the Rings clashed. That’s exactly what Danny McBride and his writing partner Ben Best had in mind when they gave birth to the idea which became Your Highness. The synopsis is just about what you’d think this team could come up with after getting really stoned and reading old Dungeons & Dragons sourcebooks. Thadeous (Danny McBride) is a lazy, arrogant prince with his brother, Fabious (James Franco) must go on an epic quest in order to save their father’s kingdom. Natalie Portman plays a warrior princess who is also the lazy prince’s love interest. Zooey Deschanel plays Belladonna, Fabious’ virginal bride. Justin Theroux plays Leezar, the evil wizard who kidnaps Belladonna. Michael Clarke Duncan plays the Giant Troll. Pretty funny, right? That’s what we thought. We’ve got some pretty awesome clips for you this week so be sure to check out the first batch after the jump. Catch Your Highness and all of its antics in theaters on April 8th. It’s a pretty big decision to choose the host of The Academy Awards every year. There have been some epic hosts in the past, and some pretty bad ones. One thing is for sure, it’s going to be hard to top last year’s picks of Alec Baldwin and Steve Martin. It seems like the Academy has made their choice, however, as word is coming out that James Franco and Anne Hathaway are currently booked for the event. Here’s the official press release. Franco, who currently can be seen in “127 Hours,” will be making his second appearance on an Oscar telecast. His other film credits include “Eat, Love, Pray,” “Date Night,” “Milk” and “Pineapple Express.” Franco is also known for his portrayals of Harry Osborn in the “Spider-Man” trilogy. For just about all of 2008, Danny McBride ended up being the most ubiquitous screen comedian out there based on his cameos in Fanboys, Drillbit Taylor, Pineapple Express, Tropic Thunder and more. Things got a little more quiet in 2009, as he had a starring role in Land of the Lost and the original HBO series Eastbound and Down. Now it looks like things may be picking back up for the foul-mouthed actor. The project is The Chadster, which at one time had The Hangover’s Todd Phillips attached to both produce and direct. Phillips has fallen off as director, but he’s still producing the comedy, which is moving ahead with Eastbound co-writer Shawn Harwell as scribe. The studio wedding comedy, set up at Warner Brothers and produced by Phillips’ Green Hat Films, is about a best man who has his position threatened when an eccentric, long-lost childhood friend shows up at the wedding and causes trouble. With this news coming in, a second season of Eastbound & Down on the way, McBride starring in an adaptation of the comic book Hench, and the actor popping up in another 5 films over the next year, it seems 2010 will be a repeat of 2008 for Danny McBride.